…it is they who have proved themselves true, and it is they, they who are consciously defensive [vis-à-vis Allah’s power] (2:177). Do people imagine that on their [mere] saying, “We have made a secure commitment [to Allah],” they will be left to themselves, and will not be tested with affliction? lo! We did test those who lived before them; and so, [too, shall be tested the people now living; and] most certainly will Allah mark out those who prove themselves true, and most certainly will He mark out those who are lying (29:2–3). Do you reckon that you will enter Paradise while Allah has yet to verify your struggle [in His cause], and to verify your patience in adversity? For, indeed, you did long for death [in Allah’s cause] before you came face to face with it, and now you have seen it with your own eyes! (3:142–143). As we study and reflect on the second part of Surah Al ‘Imran (ayat 121–200) — the subject of this fifth volume of the tafsir, The Ascendant Qur’an — we find precisely this test that the first-generation Muslims were put through in the early period of their life struggle in Madinah. They had experienced an unexpected but brilliant victory at Badr (2 AH), made all the more remarkable by the fact that hitherto Muslims had not been tested in battle. further, between them, they had very few weapons and war materiel — swords, spears, horses, camels, etc. — to confront a heavily armed adversary that was three times larger than their total number of 313. such disparity in numbers would prove disheartening for the bravest of souls but not the committed Muslims. 3. battlefield engagements between Muslims and mushriks are always preceded by several rounds of psychological warfare to lower the morale of Muslims. But Muhammad is only a messenger who was preceded by [other] messengers [who also passed away]; so if he dies or is killed will you retreat and fall back? And whoever does so shall not in the least do harm to Allah [but rather to himself], and Allah will make compensations for those who are thankful. And no human being can die save by Allah’s leave, at a term preordained. And if one desires the rewards of this world, We shall grant him thereof; and if one desires the rewards of the life to come, We shall grant him thereof; and We shall requite those who are grateful [to us]. And how many a prophet has had to fight [in Allah’s cause], followed by many God-devoted men; and they did not become faint of heart for all that they had to suffer in Allah’s cause, and neither did they weaken, nor did they abase themselves [before the enemy], since Allah loves those who are patient in adversity (3:144–146). This surah clarifies for us different categories of people. first, there are the truly committed Muslims that have made their covenant with Allah (SWT) in return for reward in the akhirah. No challenge is too great for them to overcome nor is the degree of oppression unleashed against them sufficient to cow them. Allah (SWT) Himself refers to such people as mu’mins in the noble Qur’an. They are addressed by the special acclamation, al-ladhina amanu, and given the felicity that if they uphold the covenant, they will receive Allah’s (SWT) grace and ever-lasting mercy. In Uhud, this group of Muslims stood with the noble Messenger of Allah (SAW) throughout the battle in obedience to his command, whether it was during the euphoria of the initial victory or during the reversal that occurred after the archers deserted their strategic positions on the elevation next to Mt. Uhud. The second category includes people that have accepted Islam but have not completely abandoned worldly desires. This group comprised some of the archers that the noble Messenger (SAW) had placed on the hill to prevent the enemy from attacking the Muslim ranks from the rear. They were given clear instructions not to vacate their posts under any circumstances even if the Muslims were being killed by the enemy. When the tide of battle turned in favor of the Muslims and the Makkan mushriks started to flee, all but 10 of the 50 archers decamped from their posts to join in collecting the war booty despite pleas from their companions not to do so, reminding them of the Messenger’s (SAW) instructions. This lure of worldly possessions cost the Muslims dearly. A certain victory was turned into a severe setback — almost a rout — from which the remaining dedicated Muslims recovered only through the sagacity and wisdom of the noble Messenger of Allah (SAW). The lesson driven home to Muslims was that commitment to Allah (SWT) cannot be contaminated by worldly desires, no matter how attractive or seductive. There cannot be two competing centers of attraction for committed Muslims: either it is the love of Allah (SWT) or the love of the dunya. Today, some Muslims naively ask in exacerbation: where is Allah’s (SWT) promised help to Muslims as they face such horrendous threats and challenges from His enemies? Allah’s (SWT) help is promised to those who make a firm commitment to Him, not the faint-hearted who have their eyes satiated by the leisures and pleasures of this world. The latter are the ones who fail to measure up to Allah’s (SWT) high expectations, and thus are not worthy of His help and grace. “So remember me and I shall remember you; and be grateful unto me, and deny me not” (2:152), declares Allah (SWT) in His noble Book. The opposite is equally true: if we forget and abandon Allah (SWT), He will surely forget and abandon us. He has no need for us; only us for Him. There was a third category — the munafiqs— who had initially come out in battle formation with the Muslims, but on the way to Uhud defected and turned back to Madinah. This group comprised some 300 people led by ‘Abdullah ibn ubayy ibn sallul, the chief of the munafiqs in Madinah. There is no shortage of these Muslims of convenience; they pretend to be Muslims but in reality give their allegiance to anyone who appears in their estimation to have more temporal power. They have no heartfelt commitment to Islam or its principles, but they are too cowardly to openly challenge the power of Islam for fear of incurring the righteous indignation of the sincerely striving Muslims. for all practical purposes, they are mushriks, indeed worse than mushriks because with the latter, Muslims are certain of their nature and identity. The munafiqs are more dangerous than mushriks because they exist and operate within the ranks of Muslims and pretend to be Muslims when they are not. The last and final category is that of the enemies of Allah (SWT). At the time of the noble Messenger (SAW), the chiefs of Makkah and their followers represented this class of people, motivated by greed, avarice, and the monopoly of power that comes with generational tribal solidarity. Today, this class is represented by imperialists and Zionists. They covet other people’s resources — oil, land, minerals, etc. — and are even prepared to wage wars against them. Millions of people have been killed in their drive to acquire these riches. Human life has no meaning for them. In fact, the mushriks of Makkah had some admirable qualities: they were hospitable and lived according to a code of honor, however primitive. for instance, if they provided protection to someone, they would lay down their lives for that person. The vultures and parasites of today have no such scruples or values. They abandon their own values and stated principles when these do not suit their immediate self-proclaimed national interests. In this sense, they are even worse than the mushriks of Makkah. As we imbibe the lessons of Uhud contained in the ayat of this impeccable Qur’an, we find that these lessons of life are as applicable today as they were at the time of the noble Messenger of Allah (SAW). In the variegated experiences of life, war may become necessary to separate the truly committed from the freeloaders. While Muslims are not called upon to initiate hostilities, Allah (SWT) gives them complete freedom to defend themselves with whatever means at their disposal if a war of aggression is launched against them. Today Muslims are faced with locust-like invasions of their lands. Every lethal weapon is used against them. Those Muslims that stand up to defend their land, their families and their honor are branded as “terrorists.” such perversion of truth is the hallmark of a system and civilization that has declared war on Allah (SWT) and His committed vanguard. The lessons of Uhud should help us identify not only the enemies of Allah (SWT) and the truly committed Muslims, but also the opportunists (munafiqs). The truly committed must behave with a deep sense of attachment to Allah (SWT) and His noble Messenger (SAW). In the majestic Qur’an, Allah (SWT) states this precisely, O You who have made a firm commitment [to Allah]! Shall I point out to you a bargain that will save you from grievous suffering [in this world and in the life to come]? You are to securely attach yourselves to Allah and His Apostle, and to strive hard in Allah’s cause with your wealth and your lives: this is for your own good — if you but knew it! (61:10–11). It is interesting to note that Allah (SWT) asks us to strive in His way first with our wealth and then with our lives. Most of us will never see active combat in our lives; what we are asked to do is part with some of Allah’s (SWT) wealth that He has made us a trustee over and spend it in His cause. It is not too much to ask; what is required of us is to acquire the mental aptitude to enable us to do so. 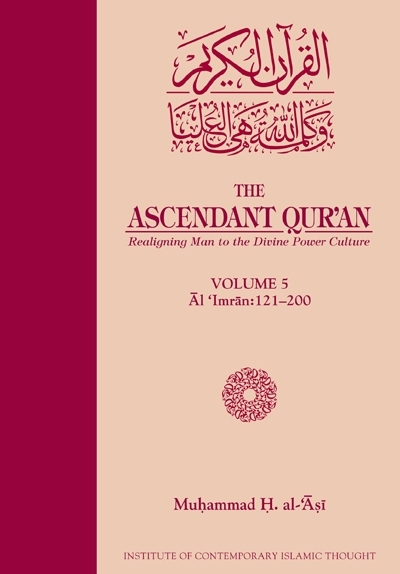 This tafsir, The Ascendant Qur’an by Imam Muhammad al-‘Asi, is meant to equip us with precisely that mindset. As we journey through this majestic Qur’an, it should enable us to deal with the vicissitudes of life secure in the knowledge that we are striving for the pleasure of Allah (SWT). And what a great bargain that is. The preparation of each volume for publication has been blessed with the openhanded efforts of a team of individuals who will only be compensated for their dedication by Allah (SWT). special thanks in this regard go out to Br. ‘Imran Khan and his wife Asiyah Muhammad, and Sr. Marjan al-‘Asi for proofreading this volume; their contributions have improved its overall quality. over the publication of these first five volumes, we have received sincere offers of help and suggestions for improvements by many who have read them. They will notice that we are listening, and as this tafsir reaches a larger audience we expect the ongoing feedback to become more nuanced, which will afford us the opportunity to continue upgrading our work with each ensuing volume.